I had faced this issue (unable to uninstall Click-2-Run file of Microsoft Office Home and Student 2010 for two days to troubleshoot for my workplace help and today I also call to ask for help from Mr. Chhourm Piseth, a MVP Technical Specialist, in Cambodia, and he guides me some ways but I still cannot solve it, so I decide to keep searching on my giant library on Google Search; finally I found on a blog of Mr. Sebastian. I think it's useful for me to keep this solution then I keep a post here. You will be asked to reboot. 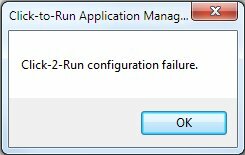 Just click ok, CleanC2R.exe will be started again"
Have you ever faced it? I hope it can help you. We, Cambodian users, are pleased to see our language available in Microsoft Office (as interface or User Interface). And I, myself, would like to thank for related person in helping or translating our language with this popular office application. You will ask or wonder What LIP means? Yeah, here it's: The Office Language Interface Pack (LIP) is a translated User Interface that installs on top of a copy of Microsoft Office 2003, 2007 or 2010, and can be downloaded and installed for free. With the LIP download, you can use Microsoft Excel, OneNote (Office 2010 only), Outlook, PowerPoint and Word features in a different language. After you have installed the LIP, you can change languages through Microsoft Office Language Preferences to see a translated user interface. Nearly all available LIP languages also include a spelling checker. Translated Help is not part of the LIP download package, but may be available as a separate download for your selected language. *Note: You must install the LIP version that matches your version of Office. For example, if you are using Microsoft Office 2007, you must install a 2007 Microsoft Office Language Interface Pack. A 2003 LIP version will not work with Office 2007.